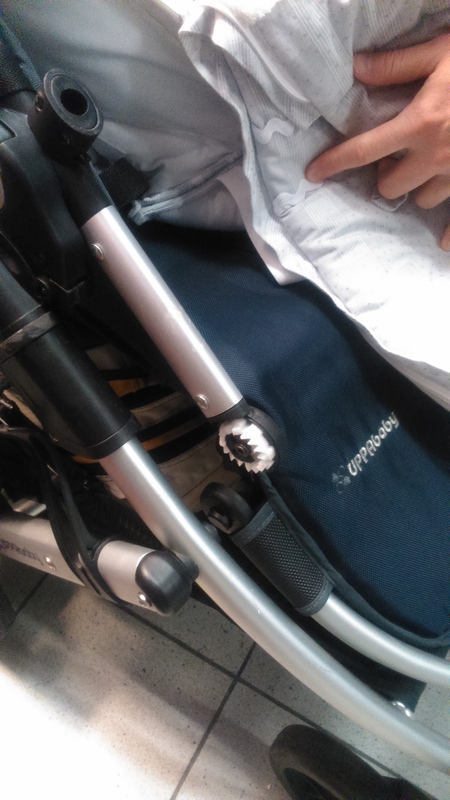 At the beginning of January I reported my experience traveling across the ocean with an infant alone and arriving in Amsterdam to a destroyed stroller (see: Delta/KLM and the broken stroller). At that point the customer experience with Delta/KLM was pretty good as they responded quickly to my official online claim and agreed to pay to repair the stroller or for a new one. Now, a month and a half later I can officially say that that this issue has successfully concluded, but, not without a little snafu of course. We immediately went to the store where we had originally purchased the UppaBaby and were told that the damage was not repairable. We left our information as the distributor had to get back in touch to give the store an official cost estimate. Five days later when I still hadn’t heard anything back, I called the store and was told that the distributor was out of the office for a few days (or did they forget?). In any case, a few hours after the call I received by email the pro forma invoice totally the damage at 601€. I immediately forwarded everything to Delta/KLM, and a few days later received a pleasant email apologizing again for the damage and saying that I would be receiving 499€ in my bank account in a couple weeks. What a minute… I would have to pay the 100€ difference?! To this email I responded that this was not acceptable and again attached all documents as justification. Since Delta/KLM had been so efficient in responding to my online messages previously I was expecting a rapid response. However, two weeks later I had still not heard back and finally was forced to pick up the phone. Why hadn’t I just picked up the phone in the first place? Well, as the customer service game sometimes goes here in Spain, the number to call was not toll-free. And I was unable to find a free alternative number (See When It Doesn’t Pay to Call Customer Service). I was pretty adamant about not paying to call their customer service, but at the end of the day I had no choice as they were not responding. Fortunately, when I finally called, the customer service rep was extremely nice, apologized again, and within 5 minutes had reviewed my record, confirmed there was an error and immediately issued the processing of the remaining 100€ to my account. Phew. 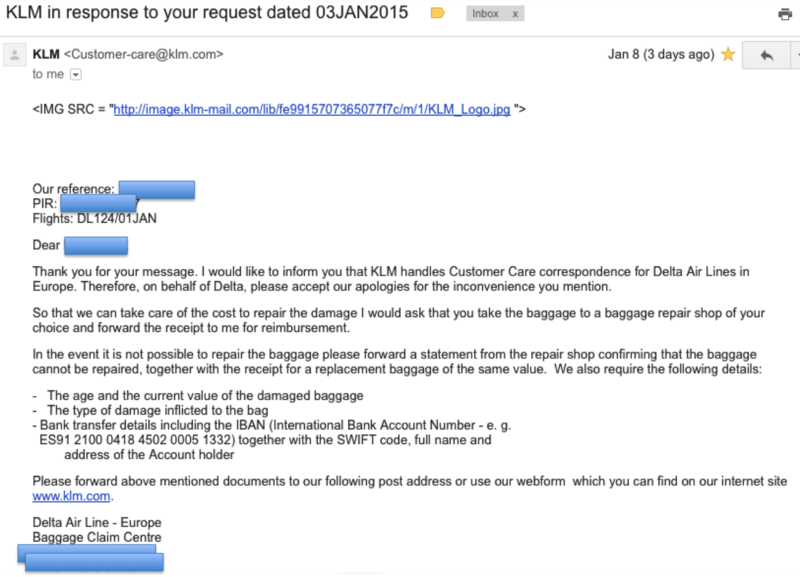 Overall, there was a bit of a disconnect between the information sent to Delta/KLM and the final result, as well as the last email that didn’t receive a response…. however, in the end, I have to say that I’m pretty happy that the airline is taking responsibility and paying. Maybe they’ll be more careful in the future since, for them, they basically just paid back my plane ticket. Note: if something like this ever happens it’s very important to file the claim directly at the airline incident desk in the airport when it happens. 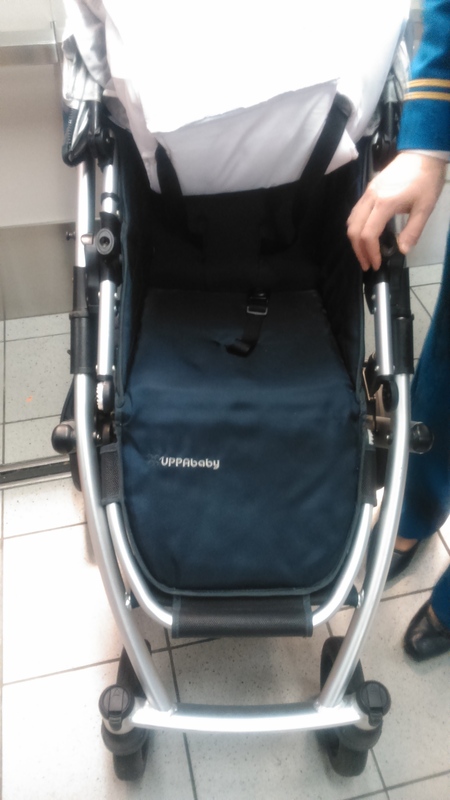 This entry was posted in Customer Experience, Miscellaneous, Travel and tagged Broken baby stroller, Customer Experience, Delta/KLM on February 15, 2015 by Michelle. 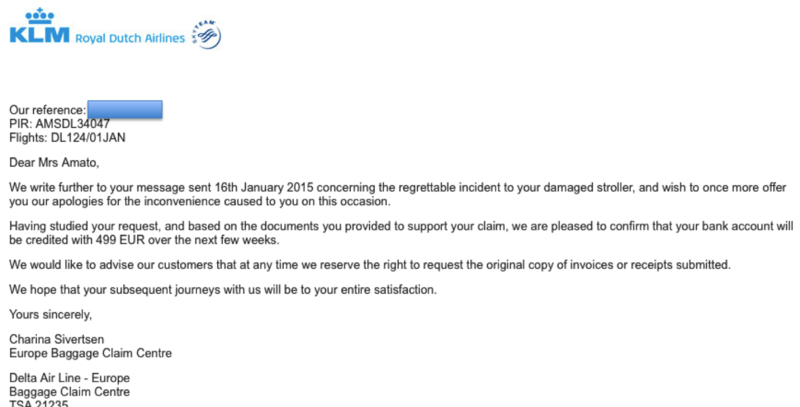 I must admit that I was quite skeptic about the response I would receive from the damage claim I filed with Delta/KLM. However, I was pleasantly surprised. Technically, there really shouldn’t have been any question since they broke the stroller during my transatlantic flight from Boston to Amsterdam. (see International Travel Alone with an Infant…) However, as I’m not used to what one would exactly call “good” customer service, I was expecting the worst and a 1000 euro loss. In order to move the claim forward I had to fill out additional information on the Delta web site and was requested to upload additional information (images of boarding pass, stroller damage, original receipt). Strangely, there was no open comments space to write any additional information. I wanted to tell my side of the story, so I uploaded a pdf document titled “URGENT” with additional information to let them know that they destroyed the only stroller I have and the urgency of the matter. Tip: whenever you travel, don’t throw away anything (boarding passes, tickets for checked baggage, tickets for baggage checked at the plane door, etc.) until the entire trip is over and you’re sure you don’t need it anymore. And, if anything happens, make the damage claim asap, directly in the airport where it happened at the service desk, if possible. First, I received an automated email from Delta/KLM thanking me for my claim and letting me know that usually they responded within 10 days, but due to delays I should expect a longer wait time. Wonderful. So much for my urgency. However, much to my surprise, five days (4 working days) later I received a personalized email apologizing for the damage and telling me how to go about getting the repair/replacement done and how Delta-KLM would pay for it! I’m now in the process of getting the necessary paperwork from the store to finish this claim and get reimbursed. Mistakes and problems happen. What is important is the way that the companies deal with these mistakes and the overall experience for the client. So far, Delta-KLM is getting a good grade in my book! 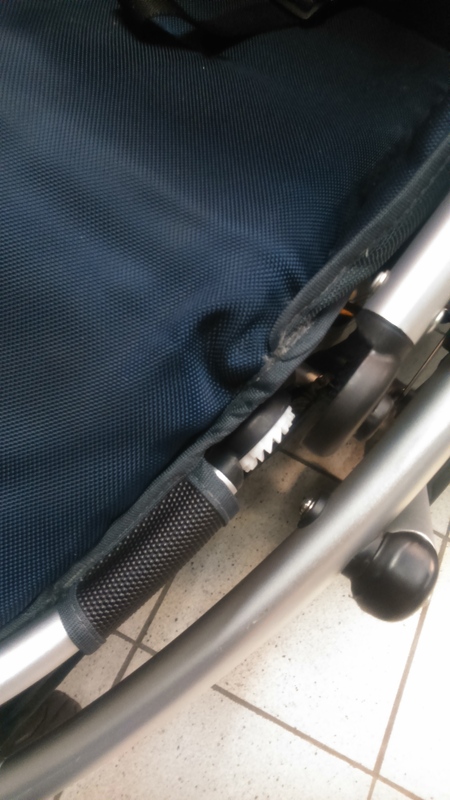 This entry was posted in Customer Experience, Travel and tagged Broken baby stroller, Customer Experience, Delta/KLM on January 11, 2015 by Michelle. Unfortunately, similar to the trip with my infant at 4 months, I had a negative experience on the trip back home to Spain that marked the entire trip. The plane ride from Boston-Amsterdam went more or less smoothly after securing the baby bassinet. (Note: I was told at check-in in Boston that they couldn’t assign me the seat with the baby bassinet. Apparently the only way to do this was to go to the counter at the gate and request it. I still don’t understand why this was not possible as I was given the baby bassinet on the way going…) Tip: make sure to get to the gate early to be the first to request the bassinet. I was the first in line and was able to get my seat switched, but if I hadn’t been lucky… Also, note that the bassinet weight limit is 25 lbs (printed directly on the bassinet), although the flight attendants mistakenly told me it was 10 lbs before attaching it to the wall. This entry was posted in Customer Experience, Travel and tagged Broken baby stroller, Customer Experience, Delta/KLM, International Travel with Infants on January 5, 2015 by Michelle.